SWS are a large European manufacturer of roller doors and have an excellent reputation. Refer to the SWS UK website for full product specifications - the important information (will it fit? how much is it?) is repeated on this page. A low security door than those above but having the advantage of a much smaller roll diameter. It uses a 55mm high, 8mm thick slat & has a 205mm roll diameter (square end plates) gives a drive-through height 255mm lower than the finished ceiling which enables the door to be fitted into even more garages than the two options above. Due to the lighter curtain weight the door is only available to suit smaller garages up to 3m wide. This door comes with a 90° half box as standard. SeceuroGlide insulated roller garage doors combine the convenience of power operation with the advantage of smooth vertical opening. This allows you to park right up to the door, whilst the pocket size transmitter enables you to open and close the door from inside your car. Meanwhile the tightly coiling curtain creates more space inside your garage to accommodate high top off-road vehicles or people carriers and does not compromise on ceiling storage space. The Compact offers guides are 60mm wide all of the way down both sides of the door from floor to ceiling and an effective locking mechanism is used at the top of the curtain. 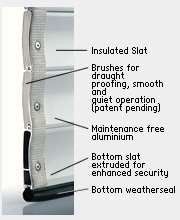 SWS roller doors have excellent draft proofing as they have a weather seal across the base of the door and thick brush-strips in the guides. This door is only available with electric operation and as standard comes with two remote controls and 'safety edge system' for stopping the door if it touches an obstruction; a 'internal switch only' option is available saving £100 against the prices below. 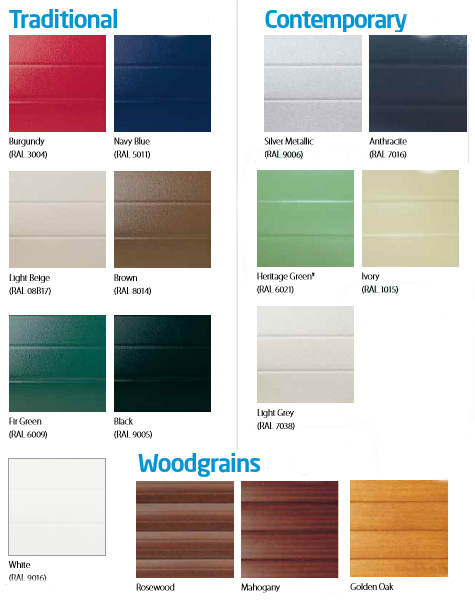 See full manufacturers specification and product details on their website (select 'Garage doors'). Also see pictures of an SWS Roller garage door being installed. You can view SWS' own SeceuroGlide sales brochure in PDF format. The door normally mounts to the inside rear face of the garage door opening but can be surface mounted within the opening if desired. SeceuroGlide Compact doors are supplied to your exact size requirements without a cutting charge. a) Measure floor to lintel, i.e. 2200mm, ensure that you have the 205mm clearance to the ceiling to accommodate the roll, if it is OK your guide height is 2200mm. b) If you do not have the clearance for the roll measure your floor to ceiling, i.e. 2300mm, take away the roll diameter, i.e. 2300mm - 205mm = a guide height of 2095mm. * Drive-through height is 50mm less than guide height. Delivery time for an SWS door is approximately 2/3 weeks. Delivery to UK mainland is included in the prices below. Colours at higher charge: Textured Mahogany Woodgrain, Textured Golden Oak Woodgrain, Textured Rosewood Woodgrain. Black, Burgundy, Navy Blue, Light Beige, Light Grey, Ivory, Silver Metallic and Anthracite doors are supplied with a white box and guides; or as an option you can have matching guides for a £40 surcharge or matching box and guides for a £120 surcharge. Mahogany, Rosewood and Golden Oak are supplied with a matching bottom slat and Brown inner face and guides. This door comes with a half box as standard, but a full box can be purchased to enclose the top 205mm endplates/axle. If you have no other access into the garage other than through the garage door itself then you must fit an External Manual Overide; this will enable you to wind the door up in the event of a power cut - it is secured by a key/lock barrel to prevent unauthorised use. Cost £165 inc VAT. If you are fitting two or more doors and wish to have each remote control operate either door then you need to choose the multi-channel receiver/remote control option. It is available at no extra cost but you only get one remote control per door. 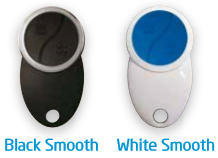 Additional remotes can be purchased at £55 inc VAT. SWS recommend the use of the photocell safety beam if you have a very short garage and the car will be parked close to the closing door. £100 inc VAT. Additional remote controls are priced at £50 inc VAT. If you do not need to operate the door by remote control and instead prefer an internal wall switch then simply reduce the prices shown below by £100. Single channel remote control receiver, two remote controls, courtesy light, internal switch, touch sensitive safety system, internal manual override. VAT and delivery to UK mainland is included. Deliveries to Eire, Northern Ireland, IOM and channel islands £50 surcharge. Please call 01342 301811 - A deposit of 20% is required upon placing your order, a credit/debit card must be used; this can be done by telephone. We do not accept cheques for the payment of a deposit. Supply only: If you wish to settle the balance by cheque then we require cleared funds prior to delivery. Payments by credit/debit card are due immediately upon delivery (not installation). Supply and installation by AHA: If you wish to settle the balance by cheque then a cheque must be given to the installation engineer once handover has been completed. If your wish to settle the balance by credit/debit card payment please telephone the office the day after installation. 4. The side that the motor is required (standing in side the garage looking out)... consider... best side for 3-pin socket and access to manual override if a car is in the garage. 5. Do you require the External Manual Release? 6. Do you require any optional items?